Are we artificially inflating/deflating students’ grades? Is this because of the rubric/assessment? Is it reasonable for a student in X grade to meet the standard on each assessment? Students’ rubric level “scores” must be converted to grades based on the meaning of the performance levels. Do not directly convert rubric level scores to percentages (“points” earned divided by points possible). After marking on the rubric the descriptors that match the student performance, look across the criteria to judge the preponderance of evidence. 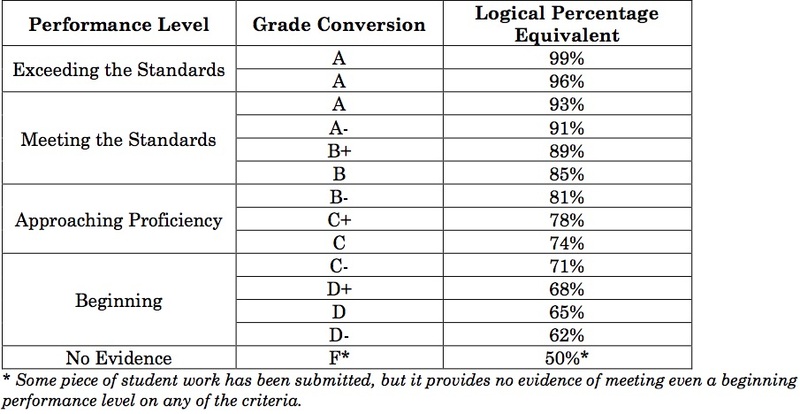 Decide where the student evidence best fits with the performance level descriptors on the Summary Table below. Select the corresponding percentage within the performance level range to record in the grade book that is the best match given the evidence of student achievement against the defined criteria of the rubric. Give consideration to relative importance of criteria and the rubric level that represents proficiency. Determine the predominant performance level of the student work based on criteria in the rubric. Then use professional judgment to convert to the corresponding letter grade and/or percentage equivalent for recording in the grade book. This table was the big spark for me. Like I mentioned above, we currently have 4 levels of performance. As a PLC, we have often discussed how the descriptors for each level of performance can sometimes box us in to a certain level of performance. Especially because some criterion have more than 1 descriptor, there is potential for a “high 3” or a “low 2.” Currently, we don’t have a method of dealing with that. So how can we branch out from our current 4 levels of performance to something closer to the 14 described in our district’s document? How can we convert them in the way described in #2? This is a bit daunting considering we have 493 students being seen by 5 lesson teachers across 3 buildings. Is there a tool we could use like JumpRope or Google Sheets to better help us process this information? The 12-Week Assessment is due Wednesday, April 8th. For students in 6-8th grade, this means completion of a checklist of items as they prepare a solo for our Middle School Solo Festival on Saturday, April 18th. Students in 9-12th grade will be performing an etude in the next key signature in their method book (Student Instrumental Course Level 2 for 9th grade, Rubank Advanced Vol. 1 for 10-12th grade). Each lesson teacher will grade the 9-12th grade etudes using the standard rubric via Google Drive that we have been using all year. Each teacher will also record a variety of samples they believe demonstrates a variety of performance levels. After the conclusion of the Assessment Cycle, the team will listen to a variety of these samples and assess using the standard rubric to calibrate our scoring. Old Rubric - More Options: Continues to use the 5 main criterion (breath support/tone quality, technique, rhythm, articulation, expression) with more levels of performance (4, 3+, 3, 3-, 2+, 2, 1, N/A). Expanded Rubric - Old Options: Expands the 5 main criterion based on each of the descriptors. Keeps the 4 levels of performance. Expanded Rubric - More Options: Uses the expanded criterion and more levels of performance. We want to see how the different options of rubric effect the overall grade of the students’ assessments. Is it more/less accurate? Do we know more/less about what the students know/are able to do?